Tomorrow’s A Busy Day . . .
We left the Spacious Country RV Park about 10:15, a little late due to the fact that the park people were late showing up to settle up on our electric usage. We gave a $100 deposit when we checked in, and then got $20 back when we left. Not bad. We were leaving that early so we could get to Colorado River TT around noon, the park checkout time. Our ranger friend, Barbara Spade, told us the park was very full and we might have a problem getting a 50 amp full hookup site. 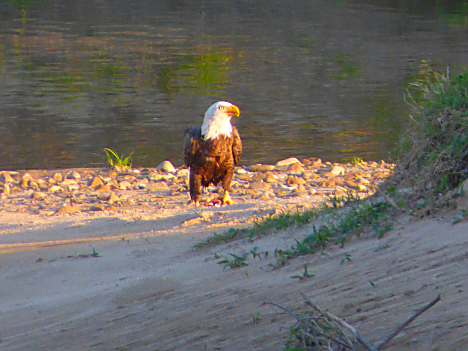 But as it turned out, we had our pick of two sites down on the river, took one of those, and got parked and set up. One notable thing on this trip was that we passed 140,000 total miles on our American Eagle coach. 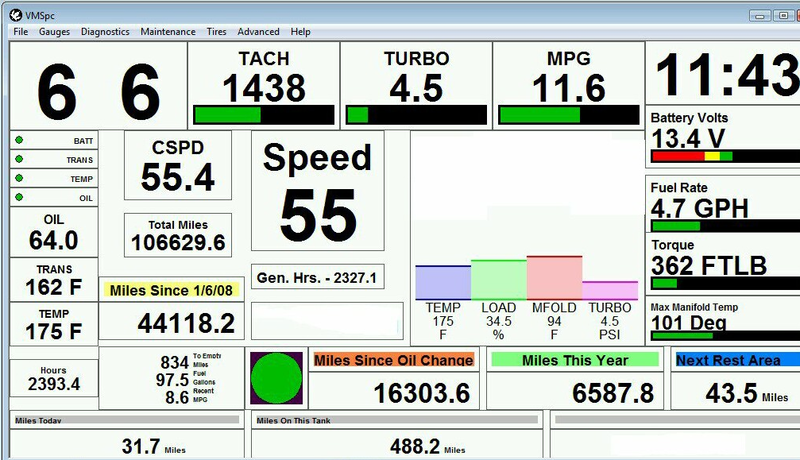 The rig’s computer records this total and we can see it on our Silverleaf computer interface. As you can tell this was about 34,000 miles ago. When we bought our rig, it had 64,511 miles on it, so that means we’ve put 75,489 miles on it since we picked it up January 6th, 2008. Later, after a short catnap, we headed into Katy to meet up with Brandi, Lowell, and Landon at our favorite Little V’s Vietnamese Bistro. Like most places we eat at regularly, we all have our go-to dishes. 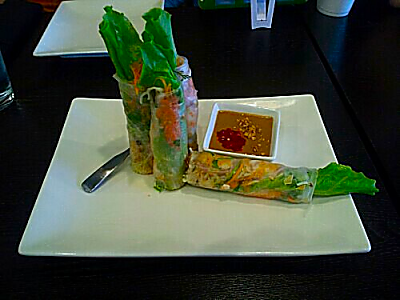 For us, we all start out with an order of their Pork Spring Rolls with peanut sauce. 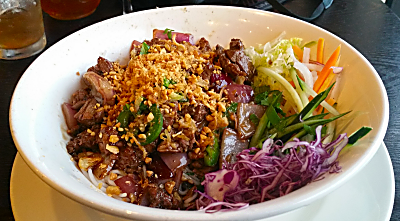 While everyone has their own favorite entrees, I always go with the Shaking Beef Vermicelli Bowl. The beef strips are marinated in a delicious sauce, and then the broth soaks into the noodles. Just fantastic. 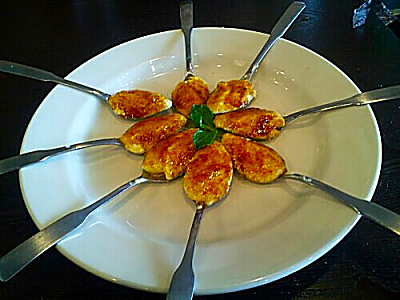 And finally we all finished up with a a little dessert, spoonfuls of Crème Brule. The perfect light end to a great meal. Today, after my first full night’s sleep in a month or so, I started working on a few things around the rig. First up was to tackle the rat’s nest of cables behind the computer table. It’s been accumulating for a while, so before they start actually breeding new cables back in there, it’s time to cut it down to size. Later. I went outside and installed the new Rain-X wipers on the truck. I’ve used this brand for several years, and combined with the Rain-X wiper fluid I also use, it keeps the glass crystal clear while the rain just beads up and runs off. I’ve also got new blades for the rig that I’ll install later. 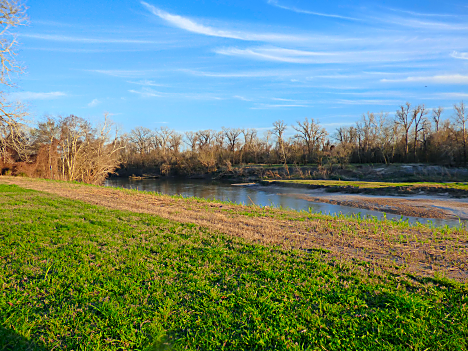 After a few more chores, I fixed coffee and Jan and I sat outside for a while and enjoyed the view. 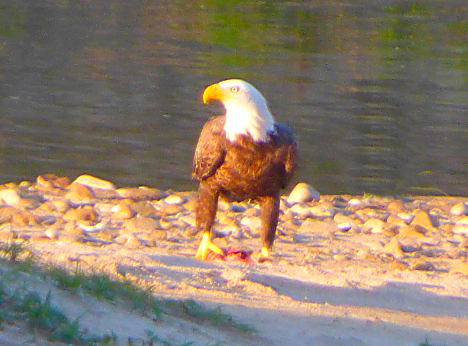 A few minutes later we noticed one of the bald eagles that live in the area swoop down and start eating on a fish he’d caught in the river. Tomorrow we have a very busy day, starting off getting to Chris’ down in the Webster about 10am so he can install a new AC condenser fan on our Dodge Dakota. Then it’s lunch at King Food, haircuts for both of us, and a visit to the Verizon store to look at new plans and a new phone for Jan.
Last up will be dinner with some old friends and then back to their house to work on a computer problem. All in all, a busy, fun day.